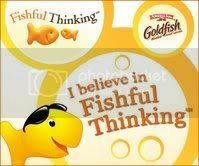 Moments of Mommyhood: Are You a Fishful Thinker? I think it's a really good program! Thanks for stopping by I love meeting new sis'ta's! Thanks again! I HAVE to get on with this!! I'm being a crummy Ambassador!!!! You, as usual, are totally on top of things! I have seen this ALL over bloggy land lately, maybe I should go check it out...but I don't have kids so I'm not sure it applies to me. It is a great program!